Catch22, working in partnership with Numbers for Good, has successfully developed a social impact bond (SIB) focused on children in need. The objective of the SIB is to transform outcomes for children through an intensive preventative intervention that addresses the underlying need of the child and their family. This both improves the long term outcomes for the children and their family and reduces demand for children’s services. The delivery model in the SIB is based on Catch22’s service FACT22 (Families Achieving Change Together) (previously Project Crewe) developed in partnership with Cheshire East Council and supported by the Department for Education’s Innovation programme. Our teams are organised into ‘pods’, with a qualified social worker overseeing each child and supported by differently qualified family practitioners and volunteers. This model combines the expertise of social work professionals with the experience and flexibility of multi-disciplinary frontline staff, enabling the dramatic reduction of caseloads. We support each family through a solutions-focused methodology to meet their different needs and goals, empowering families to take ownership of the identified solutions. Volunteer family role models and peer mentors work alongside staff, to help families sustain positive changes. This approach has the overall aim of preventing the escalation of needs, risks and costs associated with intervening too late. 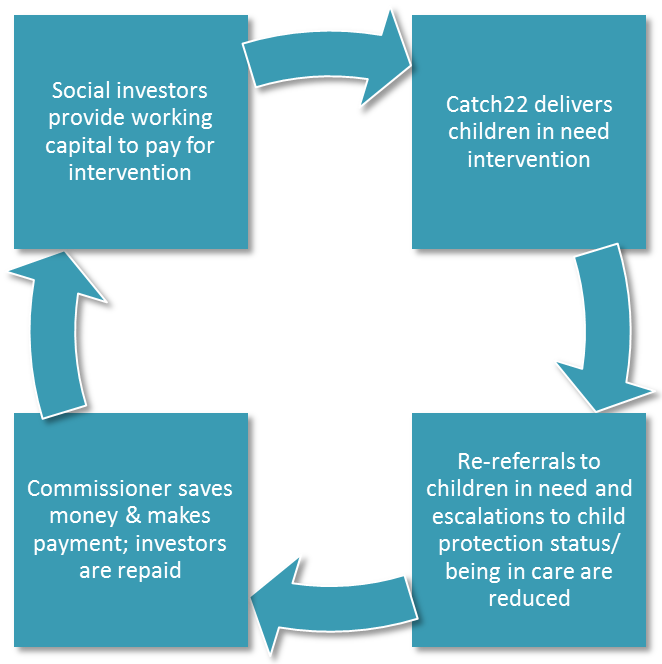 The evidence so far shows that Catch22’s model can deliver sufficient long term savings to pay for the cost of delivering the intervention. Download a calculator to develop an initial business case for the Children in Need SIB in your area.